One of the shifts we have tried to make using Common Core is incorporating real world problems into all aspects of our curriculum. When I was first introduced to this idea that everything I was teaching needed to be totally different, that it had to be SO much more rigorous and SO much more difficult, I had a mild heart attack. I thought things were going along pretty good. And, really, they kind of were. I just needed to tweak a bit. Now, what I am about to share with you is probably something you have done many, many times before. However, what I am finding with my own teaching is that looking at activities that I have done in the past with a new lens is causing me to shift just slightly and make the work a bit more rigorous. It really isn't taking a lot of work on my part, just a different perspective. In class, we have been working on adding and subtracting decimals. I wanted to break out my tried and true Book Order Math project that I have done in the past (click the pink words and it will take you to the link for that one), but we haven't touched upon multiplying decimals yet. So I decided to take a slightly different angle with the book orders so the kids could practice the skill of adding and subtracting decimals with a real world application and challenge. I asked the students to choose 6 books that they wanted to purchase in this month's book order. They cut those 6 listings out. What I then had them notice was that for each of the listings, there was a big red price that was exclusive to Scholastic, and then a crossed out retail price that would be found if this book was purchased in a book store. 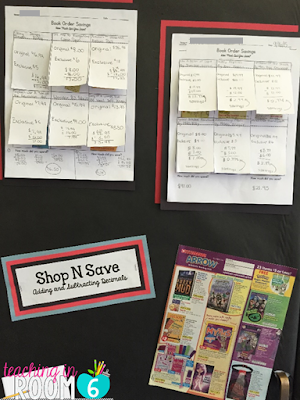 I instructed the kids to figure out how much they would be saving on each book by buying it through the book order as opposed to going to a book store. After some discussion, as a class we settled on subtraction being the best was to find this out. Next, I wanted the students to figure out two things: 1) how much would they spend by purchasing all 6 books from Scholastic and 2) how much would they save in total by purchasing through Scholastic as opposed to the book store. Once I laid out the task for them, I took a step back. I wanted the *students* to figure out how they would discover the totals. I honestly wanted to see what they would do without any intervention from me. At first, some just sat their waiting for my instruction. But eventually, they all started putting pencil to paper and began working. As I walked around, I used guiding questions to get the students to think about the operations to solve the problem. Some needed more guidance than others, but in the end, the kids all figured out what operations were necessary to solve the problem. I then asked the students to explain their thinking and strategies (similar to how they do it in the Two Ways problems each week.) Reading these really helped me to see who "got it" and the processes involved, and who just really knew the rote skill of it all. This was something that I think just elevated the project for me as a teacher and helped me to guide my next lessons. Now, how did I tweak this? It really came down to the fact that I wasn't spoon-feeding the kids the operations. I made them think, and struggle, to come up with the solutions. They needed to justify and explain how they formulated their ideas....especially with the end part of the task. The students were in charge of deciding how to attack the problem and calculate the end products. As a teacher, though, I had to think about all of that myself. I consciously made the decision to back off. It didn't just happen. And when I did that, it upped the rigor for the kids, engaged them a bit more, and was able to better focus my future lessons. Like I said in the beginning, this wasn't anything *new*, just a shift in perspective and outlook on my part as a teacher. That shift caused slight changes that really impacted the lesson and my students as a whole. Click here to get the sheets I used with the students. What is one lesson you have done that you can think of a tiny shift that can be made which will cause a big change? I now have an idea of what to do with those extra book order forms. What a great idea! Thank you! I LOVE this! For third grade I can have them round the prices to the nearest ten estimate their total. Thanks for sharing! Yes! I'm going to do that with my third graders! This is a great post! I will be bookmarking this and coming back when I have a chance to take some notes. You have a new fan! Neat activity. I will share this with my math teachers. We are always looking for meaningful real world activities that would mean something to our students. I enjoy reading your post. I'm challenging myself to do better on my blog. Thanks for sharing. I used them to have my students sort fiction vs. nonfiction books. They folded their paper in half, wrote the headings on either side, and cut and pasted books to prove they knew the difference. They loved it!